This festive season in London, celebrate Christmas the right way with this spectacular Christmas celebration banquet situated at a stunning venue in the heart of central London. This Victorian masterpiece really has the wow-factor and is this year offering guests the chance to experience inimitable luxury and hospitality with timeless English elegance. With this deluxe exclusive package, you and your team will be treated to everything you could possibly want to celebrate your Christmas party night in pure style. On arrival, a delicious welcome drink will mark the start of the evening; enjoy sipping your drink and admiring the decorations of your suite as you relax and catch up with friends and colleagues. It won’t be long until you’re seated at your beautiful dining table and indulging in a mouth-watering three course meal from the fantastic festive menu. A half bottle of house wine will be provided for each guest, along with a half bottle of still or sparkling water. Crackers will also be included, so get ready to pull one with your neighbour and revel in the festive merriment! Your private party room will also feature a dancefloor; a DJ can be included within your package for an additional charge, so you and your group will be free to dance and party the night away. 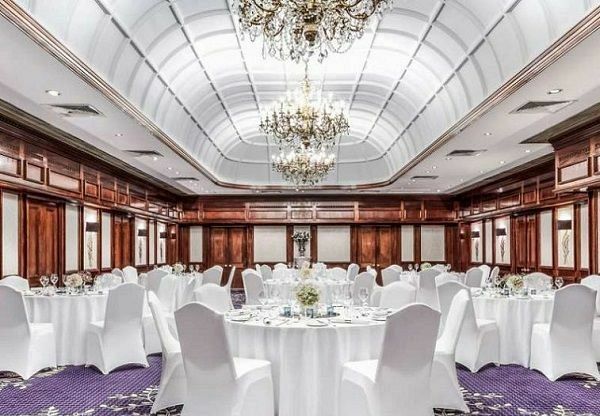 This venue is simply breath-taking and will be sure to provide you and your team with an unrivalled and unforgettable exclusive party night – send an enquiry through to this excellent venue today!